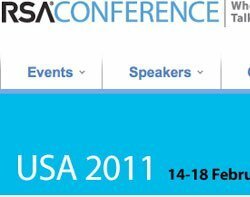 Cybersecurity is one of the key topics at the RSA Conference 2011 taking place this week in San Francisco. The topic is to be addressed by US deputy secretary of defence William Lynn, a panel including former US secretary of homeland security Michael Chertoff, the executive director on the US National Cyber Security Alliance, commander of the US Cyber Command Keith Alexander and other White House officials. The keynote programme kicks off on Tuesday with a keynote address on the hot topic of trust in cloud computing by Art Coviello, executive vice-president of EMC and newly named executive chairman of RSA, the security division of EMC. Tom Heiser, formerly RSA chief operating office, has taken over Art Coviello's role as RSA president, but will continue to report to Coviello and be responsible for the day-to-day leadership of RSA. As executive chairman of RSA, Coviello will continue to drive RSA's strategic initiatives, and as executive vice-president of EMC, he will lead EMC's trusted cloud initiatives, the company said in a statement. "Tom is a tireless advocate for our customers and his leadership, energy and commitment to excellence make him the perfect person to lead RSA into the future," said Coviello. This year's RSA Conference marks the 20th anniversary of the event, which attracts the information security industry's best and brightest to discuss current and emerging threats. In addition to presentations on cybersecurity and security in the cloud, highlights of this year's event include an address by former US President Bill Clinton and a panel discussion by leading cryptographers on the most pressing issues facing security professionals. Other keynote speakers include Scott Charney, corporate vice-president for Trustworthy Computing at Microsoft, George Kurtz, worldwide chief technology officer and executive vice-president of McAfee, Enrique Salem, president and CEO of Symantec, Philippe Courtot, chairman and CEO of Qualys, and Bill Veghte, executive vice-president, software and solutions, enterprise business at HP.